THE SUPERHUMAN GAMES! What an amazing day! Just wow really! Before I get into the nitty gritty I just want to say that I had the most incredible experience, just a wicked day all round, and I loved every second of it! So this is my third year of attending the Games, but first year competing, as it’s a pairs competition and I have awful luck getting or keeping partners! So we rolled down to Bristol, a lovely 5am leaving time on the day for an 8am registration. 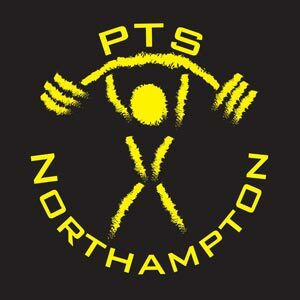 The PTS crew competing was me and Ashley Rowley in the Men’s Open, Kerry Gowen and Leanne Clifford in the Women’s Open,Linda Johnson with Jen from the EMR crew in the Women’s Open, andJustin Green and Mark Johnson in the Men’s Masters (40+). You may notice that Kerry is in the Women’s Open despite being in her forties herself, and that’s because as it’s a pairs competition it’s the average age of both competitors that dictates what category you go in. Yes it’s rude to talk about a women’s age but I hope I dodge a beating this time as it should garner more respect for what goes on! The weather for the day looked like it could have been a mixed bag of pretty much anything, it was lovely and warm, cloudy all day with threatening looking rain clouds clearly just there to watch the competition rather than rain all over it, which I’m grateful for! So once Mother Nature, cheers! Well done on not being a meanie! For those of you not in the know, the Superhuman Games is a fitness competition. It tests lots of everything, speed, strength, agility, endurance, technique, but most of all I think it really tests toughness, especially of the mental kind. There are 5 very varied events and each one is 20 minutes long. As it’s a pairs competition you pretty much split the work between you how you want, with generally one person working at a time. And for anyone that says anything about these types of competition being easy or for the ‘weak’, please give them a go! If that is your attitude I promise you will not only be enlightened but probably humiliated too! The scale of this competition has always been big, and I do believe it’s the biggest one day fitness competition in the country. The scale of it alone is just exciting, it feels more like a festival than a contest at times! The events are all going on simultaneously, with everyone in heats and a different order of events, which you find out the week of the competition, so you don’t know what you’re starting or finishing with. Adds extra random flavour! Me, Ashley, Kerry and Leanne all got the same event and heat, so we got to have in depth tactical discussions before each one, which is a delight! There are all sorts of things to consider and the more you can break it down, analyse it and go full geek mode the better! Our first event was called Brutal Beatdown, lovely eh? The details were a 160kg tyre that needed to be flipped 50 meters, and then you had to carry your partner 100 meters, before going back to the tyre. As we were in the second heat we watched the first heat go to work, and just scratched our heads at some of the carrying techniques. People were being carried across the shoulders, or even upside down! Which just seemed a bit silly, as you needed the carry portion to recover so you could attack the tyre flip properly, as that was the demanding bit. Anyway, we had strategy of alternating flips and then boring bog standard piggy backing to recover. I liked this round a lot! The tyre felt easy to flip for the entire 20 minutes, and piggy backing someone is much easier than lifting a car on your back! Right towards the end Ashley started to suffer a little, and we completed our 8th ‘lap’, but you get a half lap if you just finish the flips, and I wanted that half lap! We motored to get it done but were 3 flips short of an extra half lap, which would have out right won our heat! As it was we got joint first, and I think overall at the end of the day both our team and Kerry and Leanne came joint 2nd in this event, so not bad! Good start to the day! 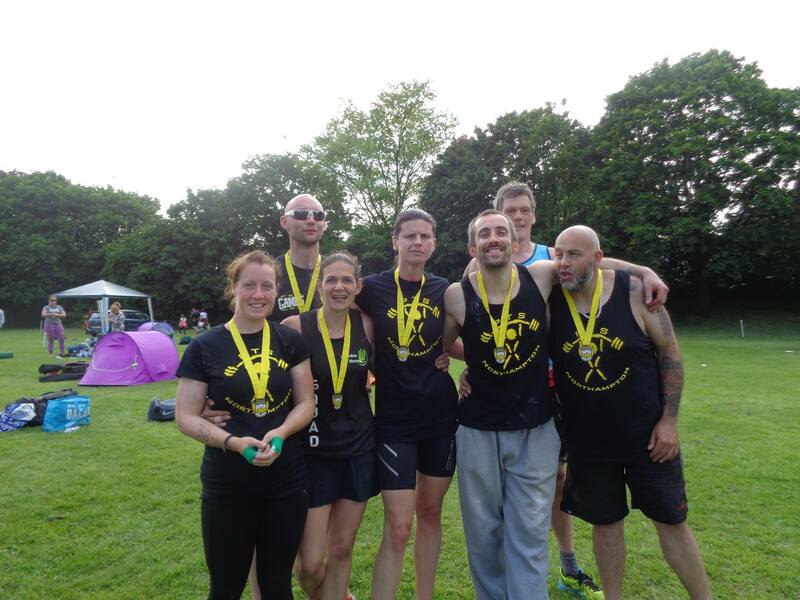 The second event was the Assault Course, a 400 meter obstacle race that you ran in relay. They’ve upped the game this year bringing in monkey bars and a traverse wall, with burpee penalties! I loved the look of this, and wanted to do well! Ash went off first and cruised round, then it was my first lap…. Oh dear. There was a section of tyres you had to run through at the start of the lap, and I misunderstood the rules about how you had to run through them, and got called off the next obstacle to have to do them again! And then there were more tryes at the end of the lap, and I was certain I had done it right, only to get called back AGAIN to do them over once more. Aaargh! So my first lap took ages, and I felt like a right idiot! Then on my second lap I mis-judged the jump off the monkey bars by an inch and had to do ten burpees for being a complete idiot! So apologies to Ashley for being a total tool, we ended up with 6 and a half laps which wasn’t brilliant, I think winning scores in the men’s was 9 and a bit laps, which is fast! Even though I was a prat on this event and really mad at myself, I loved the course and it was wicked fun! Kerry and Leanne got 6 and 3 quarters laps, which in the ladies at the end of the day was joint 2nd in that event! Sterling work as always! On another note, it seemed that a lot of people found the obstacle course to be completely lethal, with medics having to deal with utterly crazy injuries all day! Which was really baffling, as it wasn’t at all that dangerous! I’m not being flippant, I just think people need to go visit children’s playgrounds more often and get in touch with being able to roll around and stuff! The third event was Strength and Honour, which was barbell thrusters and ‘American’ kettlebell ‘swings’. Or as we affectionately call it at PTS, ‘F***ing Crosss**t’. We were all dreading this round, as it’s stuff we don’t do on a regular basis on principle. This will probably offend people but these movements done in this manner just don’t deliver the training effect or stimulus that warrants the energy expenditure or risk, so as part of a regular training regime it’s a no-no from me! But we’ll still go and do it in competition, because hey! It’s a competition! In for a penny, in for a pound! And while I don’t think this was any of our shining hours, I have to say, in a very grim way, I really enjoyed this round! Strategically we decided to split the work of 15 thrusters and 30 swings into 5 thrusters each, then 15 swings each. I hate thrusters haha! Whenever it was the round that I had to do two lots of five I was grumpy! We ended up with 8 and a half laps, which can’t have been a very good score, the guys next to us got 12 laps! I think Kerry and Leanne got 7 and a half laps, not sure how that fared overall, but that was the round I dreaded the most but like I said, I enjoyed myself despite myself haha! I do have my biggest gripe of the day though about this event; movement standards. Huge amounts of dog poo. Enormous amounts of above parallel squatting, ridiculous amounts of partial reps that weren’t even slightly subtle, it’s frustrating when form is expected but not enforced, as people in competition will always cut corners. More vicious ruthless judges needed I think! At this point in the day there was a lunch break, so I headed over to the score screen to check the overalls… I was shocked to see me and Ashley in 8th place overall, and delighted to see Kerry and Leanne in 3rd place overall! I was already having a good day but that buzzed me up nicely! The fourth event after the break was VO2 Max, which was a relay run of 800 meters each, then in the remaining time on one rower you had to burn as many calories as possible between you. I knew going in that top scores were around 370 calories for the guys and 250 for the girls, so that was the aim! We needed a strong run to give us the time, so Ashley went off first and put in a really good run coming in 3rd, then tagged me in and off I went! I expected a horde of people to go streaming past me… It never happened! I managed to hold 3rd place for the run which was a pleasant surprise! Kerry and Leanne were first girls back from the run, so a strong start from them too! The row was evil…. Loved it! We were aiming to try and get around 1500 calories an hour pace, but I just couldn’t maintain more than 1300 something for longer than a minute, so we swapped out every minute as this was smashing us fast! I don’t really know what I’m doing with rowing on the numbers side of things, but it was fascinating!Mary did an amazing job as motivator for the girls, playing the theme for Black Beauty in Leanne’s ear while she was rowing! We ended up with a score of 286 calories, the girls got a great score of 225 calories, and I have to say after this event I felt absolutely great! Really refreshed and ready to go! Just one event to go! The fifth and final event was Unconventional Beast, which was throwing a slam ball over your shoulder, 40kg for the girls and 60kg for the guys, fifteen times then doing 30 modified burpees without the jump (up downs), and that was one lap. This was wrestling practice! Suplex and sprawl training! a throwback to my MMA days! Joy! I loved this, but I don’t think Ash shared my love haha… I was trying to get air time on my slam balls, and that was fun! But as this was the last jaunt of the day, I think Ash was pretty spent, silly lad forgot his sun cream and didn’t tell us! So he got cooked too! We ended up getting 5 laps on this, which was a pretty poor score I think, the girls got 5 and a half, not sure how that ranked either. Tough event but really fun and different. So overall me and Ash ended up 55th out of 130 teams, which was disappointing but to be honest from my own personal perspective I felt great all day, and I think I need to address more tactical concerns to be more competitive as a team, and not make stupid mistakes that cost time, but strength, conditioning, stamina, technique and recovery all feel tip top so I’m happy! Kerry and Leanne, as ever, were phenomenal placing 14th overall out of 108 teams, which is an amazing result! Mark and Justin finished up 23rd out of 25 teams, and Mark was over the moon to not be last haha! Linda and Jen came 63rd out of 108 teams. So to finish I have to say that Paul Croft and the Superhuman gang outdid themselves with this event, it was just wicked from start to finish! Well organised, well ran, exciting, varied, and really demanding! And next year the Superhuman Games will have 6 events instead of 5, which excites me massively, because that means less rest between events… Lovely! Next year can’t come soon enough! And here’s some video footage! Enjoy!